One of the few things I was starting to miss from windoze was the ability to convert any video file to be able to play on a generic mp4 player. I mean nothing I tried seemed to function all that well on Linux. Sure the file would be converted to mp4 but absolutely not playable on a generic mp4 player! Well, not anymore! I finally had my chance this afternoon to use Mobile Media Converter. Apparently, these people know exactly what is needed to make those videos playable! It works and conversion time puts all utilities tried on windoze to absolute shame! Converted a 49mb rm to mp4 in a matter of 5 minutes! I dare windoze users to say that this can be accomplished in less than 20 minutes, because I know that is not the fact! Most times was a 2 step process on windoze, first to avi then to mp4. Now the miracle of Linux drops that 2 stage process to 5 minutes(if that?) saving an incomparable time of about 30 minutes! Sweet, I love it!!!! Of course one rm file was stubborn in this one step process, so a linux two step of Transmageddon and Mobile Media Converter was required! Although, Transmageddon looks like it can do the job by itself it leaves files that can not be played on the Polaroid mp4 player it was tested on!!! When Trans and MMC were used together output time was in the range of 12 minutes, still 18 to 25 minutes quicker than windoze! Looks like I am going to get to clear out some old program disks!!! Love it as all the useful utilities will remain on the OS, I put together! Linux makes it so much easier to get everything organized and together!!! Absolutely awesome!!!! Once again have to thank all here, you have all guided me in the right direction of finding the best software around!!!! When I can let you know what is great will do the same!!!! For those of us that like to have our video collection of concert footage to enjoy with us, this is a must have utility!!!! I wish you had mentioned earlier there are many ways to do this. Mobile media converter is very useful, especially if you have an older PC that doesn't play higher resolutions so well. Ironically though, my "Mobiles" have better video in general than my PC. There are a few very good programs to do this with on Windows, but yes, with no $ or hacks, I prefer my Linux. This is the best converter for Linux. 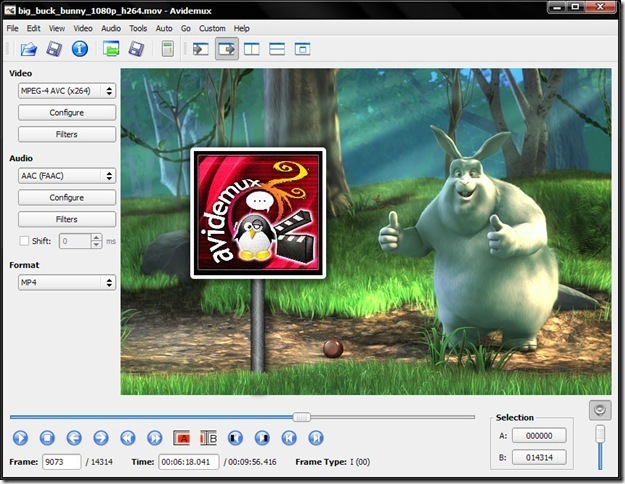 FF-Multi Converter is a simple graphical application which enables you to convert audio, video, image and document files between all popular formats, using and combining other programs. It uses ffmpeg for audio/video files, unoconv for document files and PythonMagick library for image file conversions. 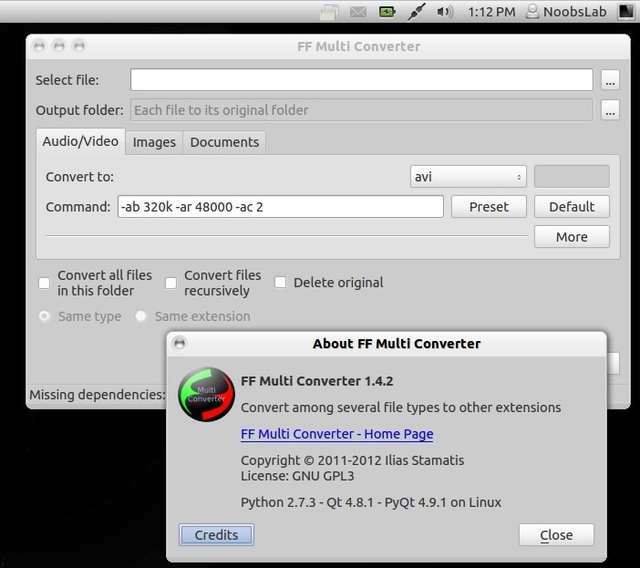 -Conversions for several file formats. -Very easy to use interface. -Access to common conversion options. -Options for saving and naming files. 2- Avidemux: it's in Ubuntu repository. 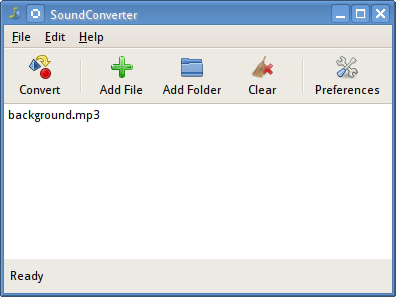 3- soundconverter: it's in Ubuntu repository. 3- Transmageddon: it's in Ubuntu repository. Curlew is multi-converter tool, it is based on ffmpeg. 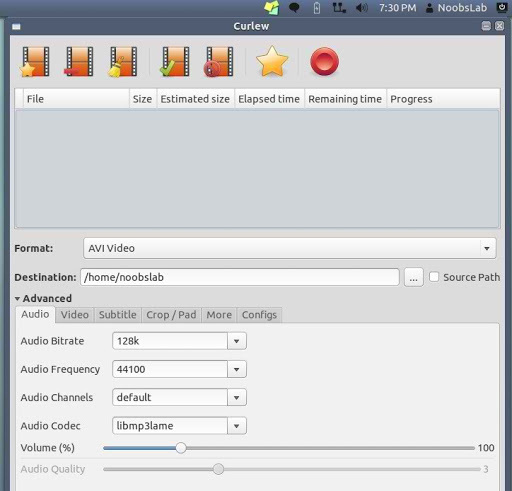 Curlew is easy to use, free and open-source multimedia converter for Linux. Curlew converter can convert to over 117 different formats. Curlew written in python and GTK3 and it depends on (ffmpeg/avconv, mencoder). Last edited by Brahim on Wed Mar 13, 2013 12:30 am, edited 1 time in total. Am looking forward to trying a couple of those mentioned! I have Transmaggedon installed but the output is not playable on my Polaroid MP4 player! I can not vouch for other MP4 players as I only have a few, including my Zune. All I can say is Trans will only help MMC in the process if needed. This is as far as I know! All other programs to this point have produced files that are not playable on my devices! Am hoping for more options, but til I can prove otherwise have to stick with MMC when needed. Of course am going to dl the 2 mentioned, try them and get back to you on that!!! I appreciate the input greatly, as I have spent loads of time on school work assembling my Own OS so I unfortunately at times do not have time for everything!!! I do my best to make time for here to hopefully give as great advice as has been given to me!!! Is the best forum in this world!!!! Try FF-Multi Converter and see what happens? Love the interface of FF Multiconverter but leaves me with file format error when I load on MP4 player. Avidemux will not convert rms and even trying to convert from MP4 made with FF leaves me with file format error! Am now trying the last one as have tried all others I know of! Seems I can not win on this as Mobile Media Converter will play on the device but I then get no sound! I wish Freecorder would work for Linux as in the past is the only utility that worked for me. Sure these files will play on the computer, but when it comes to the device will not work! I suppose the developers never tested them on ACTUAL mp4 players only their operating system! The last one curlew will not give any outputs of MP4 so is useless to me as I need it in MP4 format playable on a small MP4 player. Of course no matter which way on Linux is converted I get no sound. Linux hates sound!!!! I guess is something Linux just can not do!!! Same thing goes for sony copy protection! Linux just can not handle it!!! Guess will always need MS and can never get away from them for good!!!! Maybe one day Linux will make something that converts videos to play on MP4 players correctly with sound, but today is not that day! Are you sure it's not your MP4 player? You can put whatever in a dropbox and I'll see what I can do. I can test on low end droid. Goes to Brahim and wish I could dump the above statement. For those that are reading and not so aware with FF- Multi is one awesome tool provided is set properly!!!! You have to click on the preset button and scroll thru the list to find which device has your aspect ratio. Once this is done, will blow the doors off of Freecorder in conversion speed. Audio can be adjusted to take file size down also! Sound works fantastic along with video!!!! So the big thanks to you Brahim is a brilliant solution!!!! Sorry for the post above as get so tipped when I can not find an alternative to windoze programs. I do not want to be dependent on another OS. I want to be free of that OS forever!!!! I can not stand the sound of the kackling hard drive! I never hear that on Linux!!! Apologies also go to software developers of Linux for the above statement as I jumped the gun and became angry for no reason!!!! I simply rushed things and did not pay attention to detail!!!! For those that use Windoze on a regular basis and need video conversion, forget the rest and get Freecorder, it works and does the job very well. Is fast and is only a few seconds slower that FF. Will most likely dump the other converters I have for FF - multi as it seems no matter what type of file in video it is properly converted and plays great!!! Nice to have a great utility as such!!!! Last edited by Brahim on Fri Mar 15, 2013 3:14 am, edited 1 time in total. In a way might be better so updates when needed. Sometimes the ones you download through Ubuntu Software Center may not update as fast as one directly from the site! Have been there before on some other Linux distributions. As far as that on Ultimate, everything updated regularly!!!! TheeMahn and his crew are light years ahead of me in understanding all this!!! I loose my cool too and still feel bad. I had no right to as I have not developed one program yet! When I make a few hundred then I would have a right to say something! As I do not remember FF Multiconverter being a part of Ultimate, I sure hope one day it will become one. I have added it to my own distribution of Linux and is a major asset as works perfect. Can't thank you enough on that one as absolutely love it!!!! Is better than its Windoze counterpart as you can make smaller sizes of videos by making adjustments, thereby saving space!!! Only have a cheap 4gig so is nice to get more on it!!! If I could figure a few more admins, get my own website, I would offer my OS to all!!! As it stands now is a decent system, but needs a bit more work to be considered in the same category as Ultimate!!!! Would love to get to that point, but might be some months down the road as funds are not there! I think I might have this OS complete in a month as is going quite well! I have been using it hassle free for a few days over a month without re-installing so I would say is dependable! Still sorry for blowing off all the steam I have, I just want to make a great system, because everyone here has taught me so much! I would know zip if it were not for everyone here! I owe everyone a great system, not just a decent one!!!! !